Gellar recently stepped into a new role, entrepreneur, launching Foodstirs in October 2015 along with Galit Laibow, and Gia Russo. Foodstirs is a culinary lifestyle brand that offers convenient, delicious and healthier ways to bring families together in the kitchen. From creative cooking kits to premium signature baking mixes Foodstirs inspires creativity and curiosity, while emphasizing the importance of a healthier lifestyle. All ingredients are crafted perfectly for a homemade taste using premium, non-GMO ingredients, free of preservatives, artificial dyes and flavors. Foodstirs mission is to offer real and tasty baking products that provide a convenient and better for you way to unplug, connect, and create memorable experiences together as a family. Gellar was most recently seen in the CBS comedy The Crazy Ones opposite Robin Williams. Her other television credits include her well known role as ‘Buffy Summers’ in Buffy the Vampire Slayer, CW’s Ringer and ABC’s All My Children. No stranger to the world of voice over, Gellar lent her voice in Liongate’s Happily N’Ever After, Adult Swim’s Robot Chicken, Fox’s The Simpsons and American Dad, and Warner Brothers Teenage Mutant Ninja Turtles. Off screen, Gellar lends her time and support to child and hunger organizations as an advocate and activist. She works closely with No Kid Hungry and Baby Buggy as well as the nonprofit organization CARE. In May 2007, Sarah traveled to Guatemala, Tanzania and Zanzibar, Africa to observe firsthand CARE's work in Girls' Education. "An educated girl becomes an empowered woman who has more control over her life and well-being of her family," says Gellar. 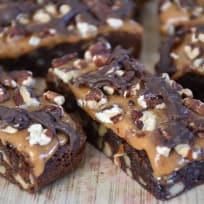 Foodstirs turtle brownie bars couldn't be easier to whip up. They'll be a huge hit at your holiday party or potluck! Apple Pie Cookie Cups & Foodstirs Giveaway! 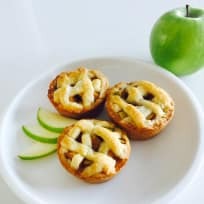 Apple pie cookie cups are a sweet little dessert you can make with your kiddos. Grab your Foodstirs sugar cookie mix and let's get baking!